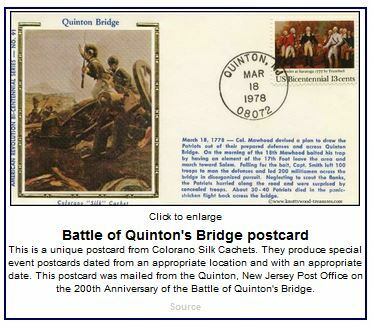 On this day in history, March 18, 1778, the Battle of Quinton's Bridge is fought by New Jersey militia near Salem, New Jersey. British General William Howe occupied Philadelphia in September of 1777. The following winter, George Washington and the Continental Army were encamped at Valley Forge. 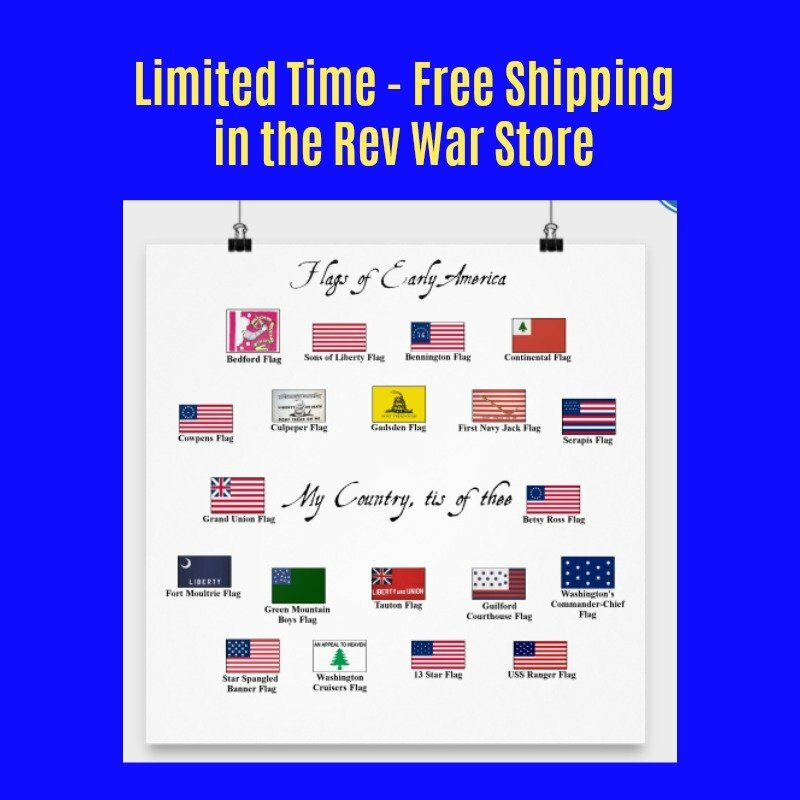 Both sides camped for the winter with no major battles, but numerous skirmishes took place between them as soldiers foraged through the countryside for food and supplies. William Hancock House Home of Judge Hancock where New Jersey militia were killed 3 days after the Battle of Quinton's Bridge. Salem County militia learned of Mawhood's movements and quickly moved to block his advance by establishing positions at Quinton's Bridge and Hancock's Bridge on Alloway Creek. They deplanked the bridges and took up positions on the side opposite the British advance. On the morning of the 18th, Mawhood sent troops to Quinton's Bridge, opposite the 300 soldiers on the other side. After a while, the British troops began a retreat, but this was actually a ruse to trick the militia into following them. Captain William Smith quickly replaced the bridge planks and followed the British with 200 men. The bulk of Mawhood's men were hiding at a nearby farm and they quickly moved to come up behind the militiamen to prevent them from returning to the bridge. Smith's force tried to cross the creek anyway and several dozen drowned. Mawhood's men tried to cross Quinton's Bridge, but they were stopped by the arrival of Colonel Elijah Hand with more militia. Hand prevented the British from crossing the bridge, stopped the slaughter of Smith's men and forced the British to retreat. Captain Smith made it to safety on a horse that had been shot twice and with a bullet wound that had grazed his head. Two days later, Mawhood sent a force to take Hancock's Bridge instead with orders to spare no one. 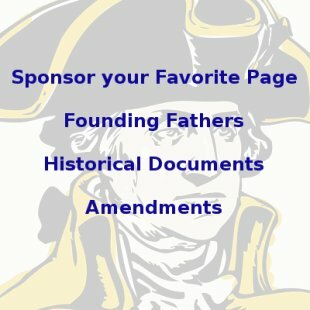 On the 21st, the British surprised 20-30 militia at the home of Judge William Hancock, bayoneting everyone in the home, including Judge Hancock. The Battle of Quinton's Bridge was an American victory because the British finally retreated, but at a heavy cost of 30-40 dead, plus another 30 at Hancock's home 3 days later. 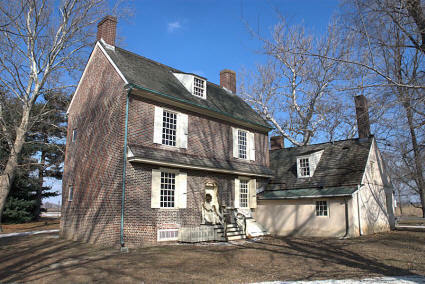 Humiliated by being beaten by a bunch of farmers and unable to cross Alloway's Creek, Mawhood returned to Philadelphia. The British never again returned to Salem County.